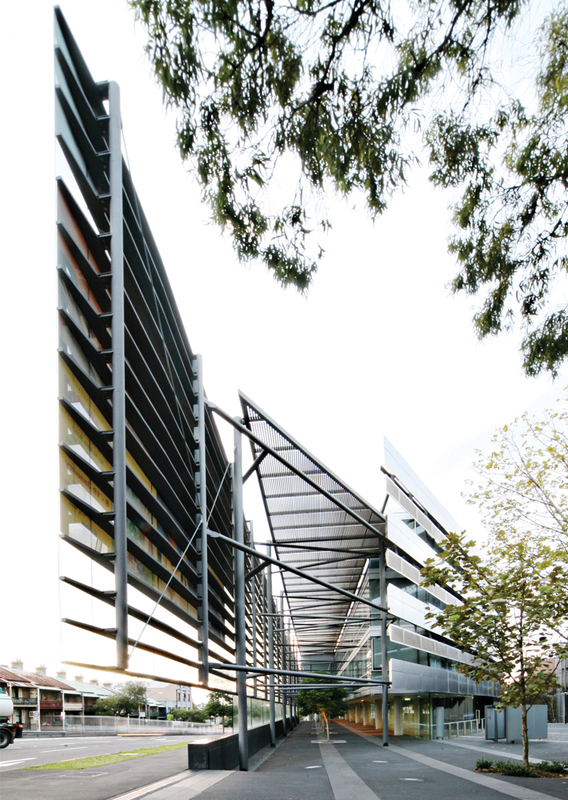 The School of Information Technologies building creates a new campus gateway, transforming a vacant site adjacent to one of the city’s major road junctions.  The overall form of the building has been determined to foster links with the Engineering Precinct, Seymour Centre theatre and wider community. 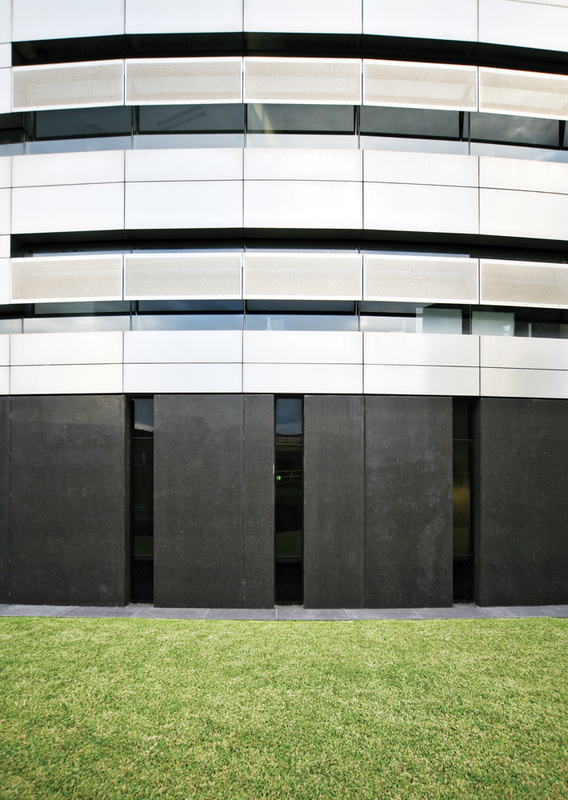 The architecture presents a layered glazed environmental screen façade, forming a buffer between the building and the traffic noise and associated pollution of Cleveland Street. The screen provides acoustic attenuation to allow appropriate indoor workplace conditions, whilst presenting a contemporary image of transparency and interaction. 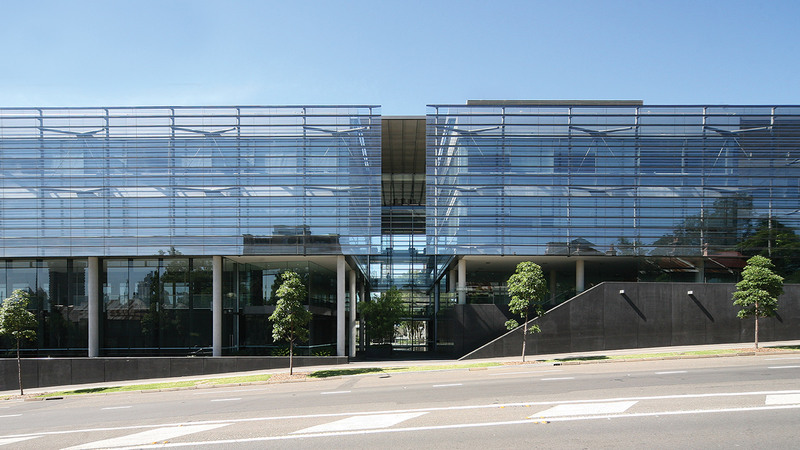 This façade is discontinued at the Engineering Walk axis to visually connect the precinct with the neighbouring community, reinterpret the former configuration and extension of Rose Street, and announce the location of the main arrival / entry lobby of the building. 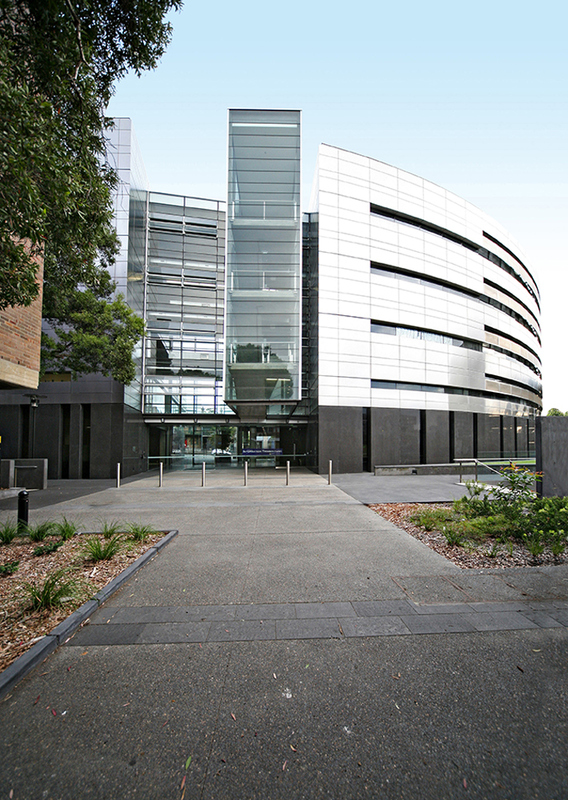 The screen extends past the building to the west to embrace the Seymour Centre forecourt. 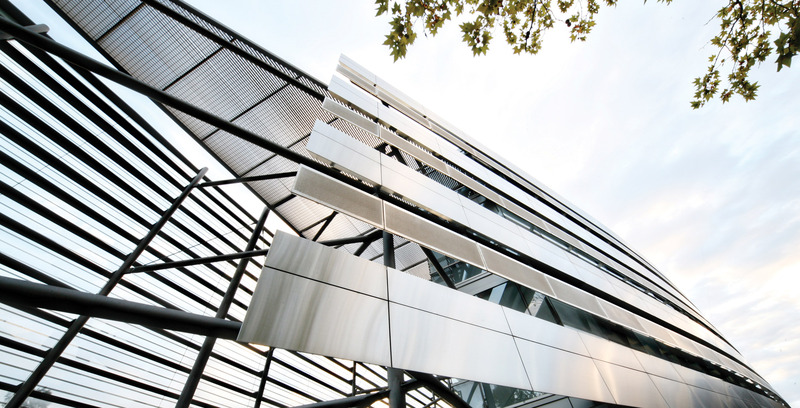 To the south, the building has a curved stainless steel façade incorporating a unique perforated stainless screen to adjust the proportions of the building and provide assistance in the protection against unwanted glare. This site-specific approach creates the opportunity to provide generous landscape zones for passive recreation and 'extend' the usage of the building to the adjoining campus areas. The building is configured as two wings surrounding a central atrium and interconnecting stair. The main glazed entry foyer is centred within the atrium, allowing the extension of Engineering Walk into the school and the visual connection through to Cleveland Street. 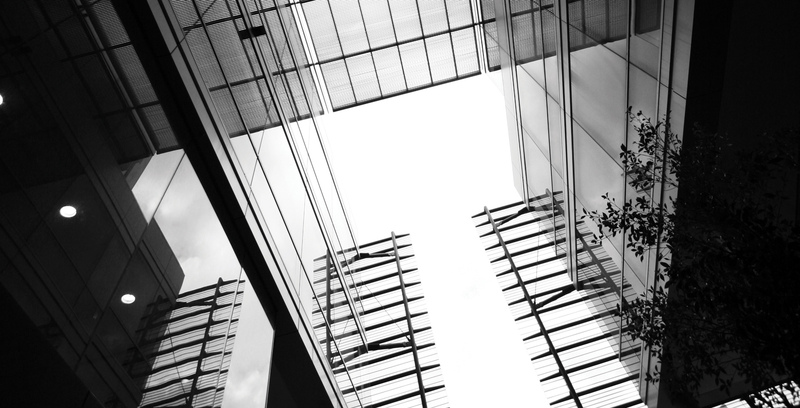 Vertical transport links are located within the entry foyer, facilitating ease of connections to the upper levels and interconnection of the main public or 'front of house' facilities of the school. Each level of the building is provided with a 'bridge' connection linking the eastern and western sections of the development across the Engineering Walk axis. Social hubs and meeting rooms are located within this naturally ventilated support zone to promote knowledge transfer through informal interaction and meeting. 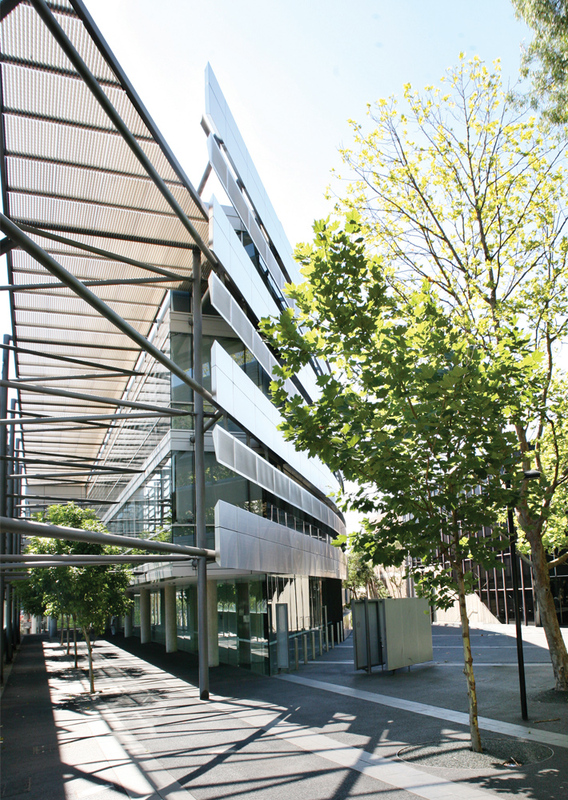 At the lower levels, the building is provided with predominantly collaborative and specialist facilities including the school’s specialist research laboratories, boardroom, common room and presentation suite. These facilities have been configured around generous wintergarden and exhibition spaces to both foster interaction within the school, and to embrace the wider community. Although this is only a four-storey infill structure on a very restricted urban site with a considerable slope from one end to the next, it has been treated as a gateway building serving both to represent the existing engineering campus and to link it back into the community.